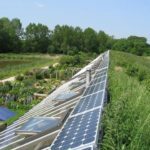 Early 1990s – A Nottinghamshire land owner became interested in creating a very low energy self build project on some of his agricultural land. His son took the lead and, following various local meetings and attendances at Green Fairs and Self Build Exhibitions, a group of five keen families emerged. The project was limited to five families because the access road would have had to have been built to a much higher (and more costly) standard if more homes had been included. 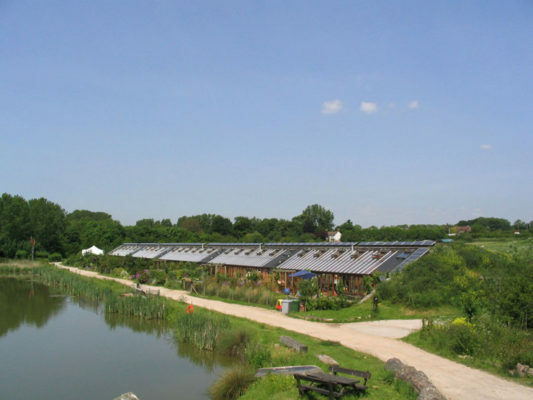 1993 – the Hockerton Housing Project (HHP) members prepared plans for five earth-sheltered houses on a 25-acre site outside the village of Hockerton. 1998 – the families moved in. 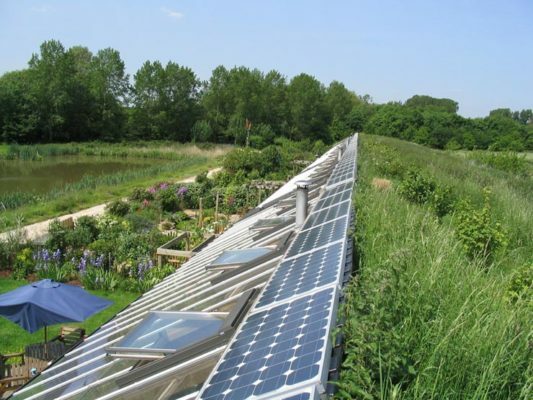 The residents generate their own clean energy, harvest their own water and recycle waste materials causing no pollution or CO2 emissions. The houses are among the most energy efficient, self built dwellings in Europe. 1994 – Planning application first considered. Several innovative low energy homes had been built in the area in the late 1980s and early 1990s, and the council’s then chief architect was an enthusiastic supporter. This backing was key to the project proceeding. In 1996 the project made planning history by securing special permission to build a sustainable housing development on agricultural land. 1995, 1996 & 1998 – Repeated planning applications for the wind turbine were submitted and it was finally granted permission in 1999. 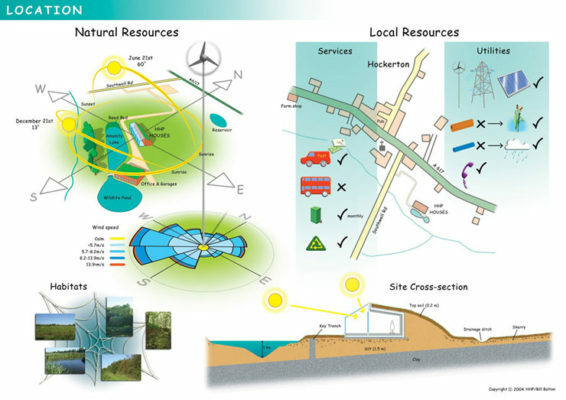 The turbine was needed so that the homes could generate their own power and meet the sustainability conditions imposed by the original planning permission. 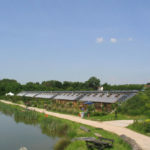 The scheme was a winner of a UK Solar Prize Award in 2000 and a winner of The National Energy Efficiency Awards in 2006. The site was leased from the land owner on a 999 year lease. Building budgets were raised in different ways depending on each family’s circumstances. The Co-op Bank provided business loans which were converted to individual mortgages with the Ecology Building Society. An agreement was drawn up among the five families that they would work collectively on the construction of the five homes (though each home was finished off internally by the families themselves). They also agreed that work would stop if anyone was unable to contribute their share of the costs. When one family could not sell their home others in the group offered informal ‘internal loans’ so that work could still proceed. Some families input more labour, others more cash. By having a common basic structure and bulk-buying materials construction costs were reduced by 5-10 per cent. 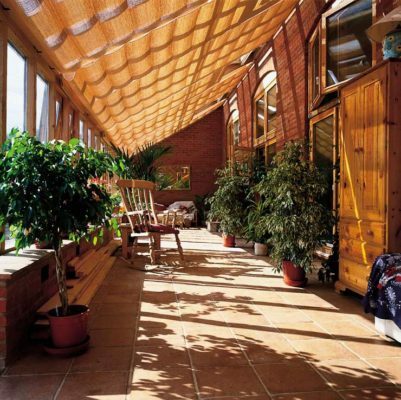 Each house is 6m deep with a 19m south-facing conservatory running the full width of each dwelling. Externally they look the same; internally they are all quite different. The cost of the homes (including land) was approximately £90,000 (£485/square metre). House build costs were £65,000 (excluding land). The completed homes are now valued in the region of £400,000 each. 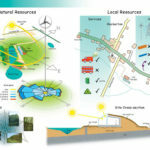 Grants and other practical support were obtained from various sources, including Biffaward, Pilkington Energy Efficiency Trust, and ScottishPower. 1998 – All the homes and associated facilities completed and leases established. Very high levels of low cost insulation, and a high thermal mass, have made the homes extremely energy efficient. They now need hardly any heating. The two wind turbines on the site, plus some photo-voltaics and solar hot water mean that 80% of the home’s energy needs are generated locally. 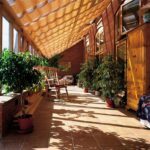 The families believe thermal mass is the key, and gets better results than lightweight construction methods that employ – for example – straw bale technologies. Forming the original team took time and there were lots of meetings and ‘getting to know you’ sessions. This is time well spent. With only five members the levels of trust built up quickly; with larger groups of perhaps 25-30 families it is harder to achieve this. The Ecology Building Society was particularly helpful and supportive. The group praise them highly. The Co-op Bank was also much more helpful than most other lenders. The heat pumps that were originally included have not performed well – four out of five of them are no longer working, and the families would not recommend them to other self builders.